Chopper, mountain bike, racer or penny-farthing, whatever wheels you have – get em rolling! You don’t have to be the next Bradley Wiggins to call yourself a cyclist. Switch a few journeys from petrol to pedal power and get fit while saving money, carbon and time. We are becoming an unfit nation. Some of us spend a shocking five weeks a year commuting.1 Imagine if those five weeks were spent exercising! It could make an incredible difference to rising problems like heart disease, diabetes and obesity. If you find yourself complaining that you don’t have time to exercise, or that the gym is too expensive, then this is the action for you. Kill four birds with one stone: exercise while saving time, money, and the environment. Bicycles have zero carbon emissions. Nill, none, nada. Around half of the car journeys in the UK are less than 5 miles.2 These short car journeys are not very fuel efficient - cold engines use almost twice as much fuel as warmed up engines,3 and these distances can easily be covered with a bike. For short journeys in a city, cycling is almost always faster: a four-mile journey in London, for example, can take half the time on a bike than in a car. If you're living in London, here's an amazing website to help you answer the burning question: Is it faster to cycle or use public transport? Running a car is expensive. Public transport isn’t cheap either. Cycling is as good as free, especially if you can hook yourself up with a cheap bike through The Government’s Cycle to Work Scheme. We all hate it. Traffic jams, honking horns, road rage... enough said. Whizz through it in the early morning sun on your two trusty wheels instead. The Cycling Experts – From independent bike shop listings to bike-buying advice, this is a veritable bible of cycling resources. 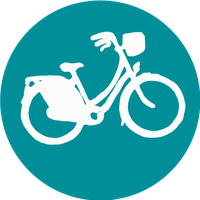 Sustrans – A national sustainable transport charity providing maps of national cycle routes and plenty of other great advice on cycling and walking. Transport for London Cycling Guides – Maps of the city’s many cycle routes, safety tips, maintenance guides and listings of bike-related events and special offers. A fantastic resource if you’re based in London. Once you've got your bike, it's time to get geared up. Check out our friends at Torm who specialise in comfortable gear for cyclists. Alternatively, you can try Wiggle who offer some great discounts on quality sports gear, and you're off! I'm having so much fun cycling to work. It takes 20 minutes instead of 40 on the bus I'm getting healthy and feeling more awake when I arrive. I cycle every day, not just the 4 journey's pledged. I LOVE cycling to work - it's a great way to save time, build exercise into my every day life, and save money too! I now cycle in EVERY day, not just 3x per week which was what I pledged. Brilliant way to get to work! Now to get some warmer clothes for the winter cycle in! I drive my bike into work in my car (2 miles over otherwise dark country lanes) during early winter mornings then cycle onwards through Oxford 4-5 times a week to an early morning yoga class or swiming pool session (half mile to one mile depending on how eearly I rise). Hope to cut out the car altogether come the lighter summer mornings. I cycled 5 times per week for the 10 weeks and have therefore completely exceeded the target. I am now continuing to cycle daily to UCLan.